SPECIAL PRICE 195.00 PICTURE SHOW ROBE WITH STOLE, BUT THE 195.00 SPECIAL IS WITHOUT STOLE. 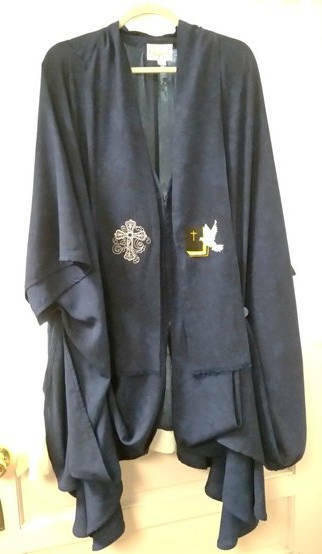 THIS STYLE ROBE IN RAYON BATIK BLACK, NAVY OR CREAM AND MATCHING STORE ARE ON A LIMITED TIME SPECIAL ON MY VESTMENTS WEBSITE. BEAUTIFUL LIGHT WEIGHT NAVY BLUE RAYON BATIK FABRIC. THIS DESIGN IS CALLED MY ANGEL ROBE AND IS MY ORIGINAL DESIGN. THERE IS A HIDDEN ZIPPER IN THE FRONT FOR CLOSURE. VERY FLATTERING FLOWING DESIGN. THE STOLE IS SOLD SEPARATELY. THIS STYLE ROBE IS USUALLY WORN MID-CALF LENGTH, BUT CAN BE ANY LENGTH YOU WISH.